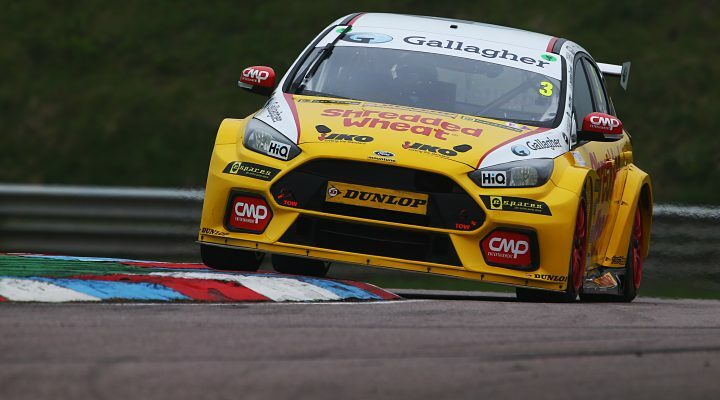 Team Shredded Wheat Racing with Gallagher’s Tom Chilton headed the way in the opening Free Practice session from Thruxton Circuit this morning. Twenty-three of the 32-car field made the trip to Hampshire for the annual TOCA Support Test and it was the Ford Focus RS leading the early running as teams began to work through their busy programmes for the day. Chilton’s 1m15.979s was inside Matt Neal’s pole time, and lap record, set in qualifying here last year. “Thruxton’s one of my favourite circuits, along with Brands Hatch. I do love it here.” said Chilton. “I used to be an instructor here, so I know it very well. We worked through some qualifying runs this morning and we may use some newer Dunlops this afternoon to see where we can go. Senna Proctor continued where he left off at Brands Hatch with the second fastest time of the morning, just a tenth-of-a-second shy of Chilton’s timesheet-topper, with his Power Maxed with TAG Racing team-mate Josh Cook making it two Vauxhall Astras in the top three. The new-generation FK8 Honda Civic Type R, in the hands of Dan Cammish, rounded in fourth spot with reigning champ Ash Sutton and Trade Price Cars with Brisky Racing’s Mike Bushell completing the top six. As is always the case in testing, however, pace is not always the immediate priority – especially during the opening throes of the campaign. Teams and drivers are continuing the learning process as they look to unlock their 2018 machinery and evaluate the Dunlop SportMaxx compound for the Thruxton race weekend, 19-20 May.